A Touch Morbid brought up more questions than it answered. Something is happening to Eden throughout the book, and while we’re given an explanation of how it is happening, we’re not really given the why behind the how. And some of the new characters, like Sullivan, why they were added to the story, what’s going on with Touch and whatnot. I’m hoping those things will finally be revealed in the next sequel. Eden and Az are finally together, but it definitely isn’t happily ever after. They’re keeping secrets from each other, major secrets that will can change everything, and they’re just barely holding on to each other. I have to say that I honestly would just love it if Eden were to somehow end up with Gabe, because I much prefer that pairing to Eden and Az. That is just wishful thinking on my part though. Alliances are also changing. 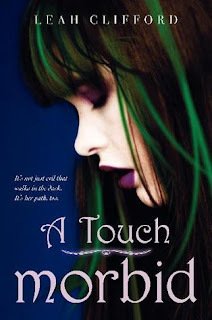 Whereas Kristen and Eden reluctantly worked with each other in A Touch Mortal, in Morbid we see more of Madeleine and Eden working together in a way, and Kristen going to someone else for help, since Gabe isn’t around to do what needs to be done. Also, while we do see snippets of Gabe here and there throughout the story, it wasn’t enough. I’m hoping to see more of him in the third book. Overall the book was just as good as A Touch Mortal, but the pacing might throw some people off. I kind of felt like I was waiting for something to happen most of the time, and then everything seemed to come together in an action packed end. Excellent review, I’m looking forward to A Touch Morbid! I haven’t read the first one yet so I kind of skimmed it so I didn’t spoil too much but it sounds awesome. I hear so many amazing things about the first book.